“Trust your boots!” My friend Jamie and I encouraged each other as we scrambled up yet another near-vertical slope of sandstone. 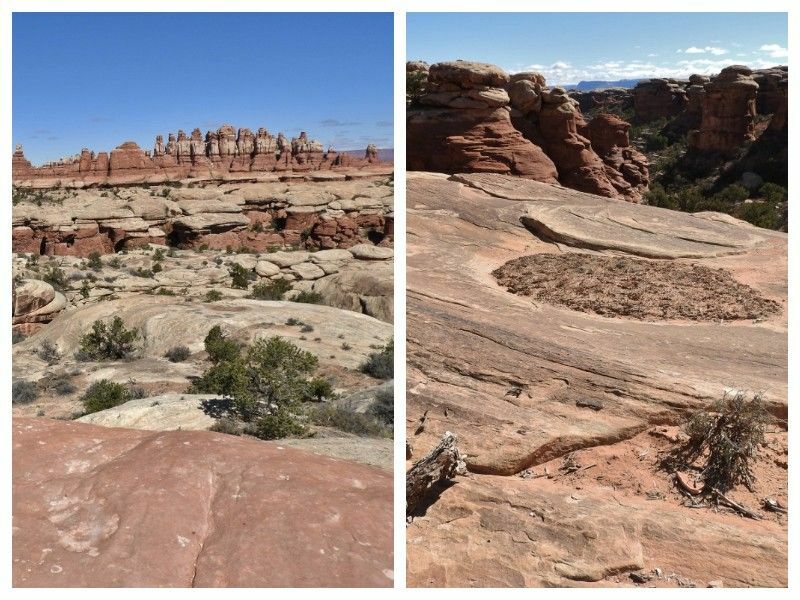 “Trails” as they call them in the Needles District of Canyonlands National Park in Southeast Utah, are often just cairn-marked exercises in disbelief. You want us to climb that? Should we really descend there? We have to jump what? Nevertheless, our boots gripped securely onto the rippled sandstone slope and we found ourselves admiring another spectacular view. Clustered spires of red and white rock reached up into the brilliant blue sky. 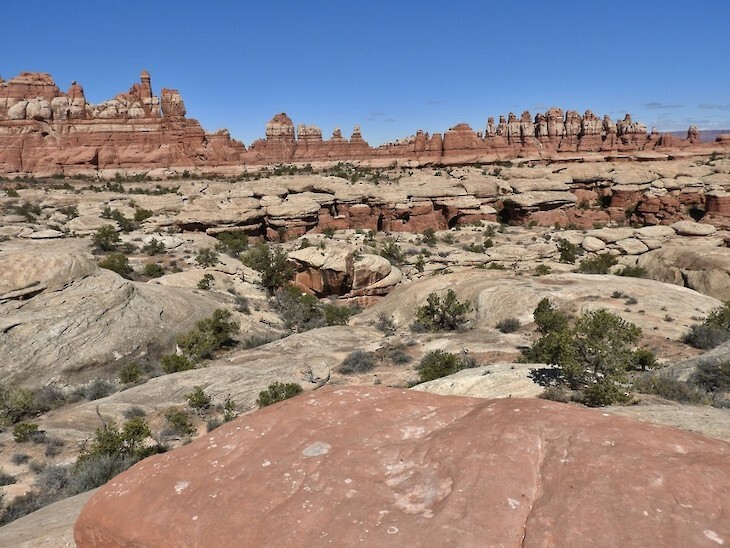 Where the spires had eroded away, a whimsically lumpy layer of white sand dunes-turned-bedrock clustered like mushrooms that only a nimble giant could hop along. Still lower, the pinkish soil of the canyon floor lay sprinkled with dusty green bushes and rich green Utah juniper trees. The Needles District of Canyonlands National Park in Southwest Utah boasts an incredible geology on both big and small scales. Photo by Emily Stone. Over 200 million years ago, this area sat on a battleground between swirling white sand dunes and muddy red streams. First one and then the other advanced their troops to deposit alternating layers. Eventually, everything was buried by even more sediment, and mineral cements hardened the sand into rock. Uplift from deep in the Earth caused fractures to form in an intersecting grid. Water and ice worked their erosive magic along those planes of weakness, and this pinnacled landscape emerged under the sculpting powers of geology. After Jamie and I caught our breath at the top of the slope, we meandered from cairn to cairn (cairns are small stacks of rocks often used to mark trails) across a potholed and gently undulating surface of old dunes. The view was never not spectacular, so we spent a fair amount of time gazing out over the hoodoos. You know me, though, and I couldn’t help but look down, too. Nestled into some of the bigger potholes and concave slopes were needles on a much smaller scale. A delicate white wedgeleaf flower found refuge among the pinnacles and valleys of cryptobiotic soil crust in Southeast Utah. Photo by Emily Stone. I just had to squat down for a closer look. The rugged surface of this pothole planet—for it did look kind of alien—was carved into miniature fins, spires and mesas. Dusty red sand was clearly at the base of everything, but it only peeked through the rainbow of black, white, orange, green, and even bluish skin. “Cryptobiotic crust,” we’d learned to call this strange microcosm during our long-ago intern training. Cryptobiotic crust is sandy soil that had been glued together by tiny living things. Cyanobacteria move in first. While often referred to as blue-green algae because of their ability to photosynthesize, they are actually ancient bacteria who played a part in creating the oxygen-rich atmosphere we enjoy today. Although dormant when dry, the sheaths surrounding cyanobacteria cells swell and produce little filaments as they absorb rainwater. Damp filaments weave among the soil particles and grab on. As the cyanobacteria dry out, the filaments secrete complex sugars which harden into glue. Over many years and many cycles of wetting and drying, a fragile crust develops. It prevents the sand from blowing away in dust clouds or becoming shifting fields of dunes. 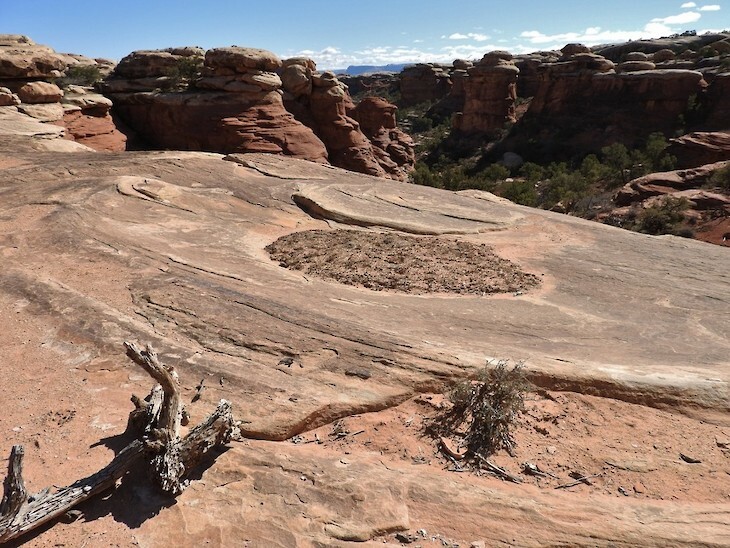 “Crusts are the glue holding this place together,” claims my well-worn Naturalist’s Guide to Canyon Country. Sand dunes turned to rock provide an undulating surface where potholes can catch sediment and allow for the development of cryptobiotic soil crust. Photo by Emily Stone. The crust’s diversity of both color and texture had brought me to my knees for a better view. Over the winter, frost heaves up the surface unevenly. Pedicels rise up to a few inches high and then plunge into sandy ravines. Against the dark surface veneer of organisms with UV-protective pigmentation, I saw rimes of white, dots of pink, caps of yellow, and cushions of emerald. The sugary glues and pore spaces between sand grains soak up water like a sponge, which improves the neighborhood for those colorful lichens, fungi, green algae, and mosses, whose rootlets also help hold the soil. The cyanobacteria can also fix nitrogen directly out of the air, and their leakage constitutes fertilizer. 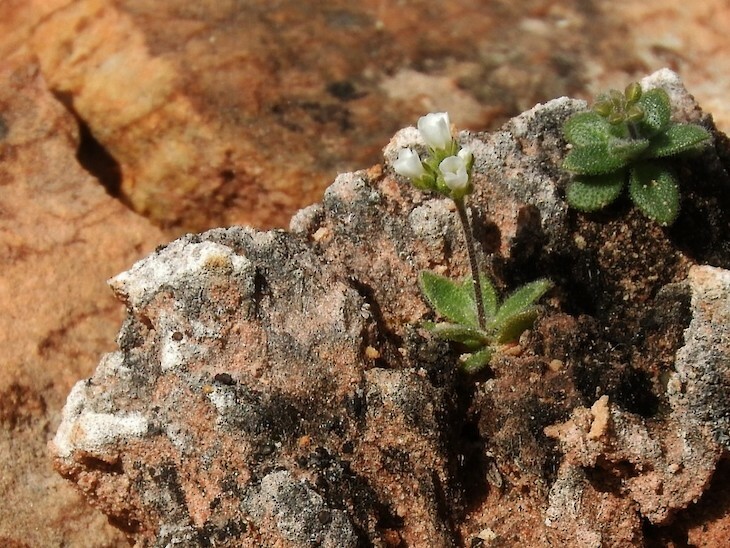 Tiny plants use those nutrients where their seeds have sprouted in the shelter of the crust. Miniature white clusters of wedgeleaf flowers peppered the pinnacles like a fairy forest. Even this tiny world was not without catastrophe, though. One careless boot print on the edge of this pothole had crushed the fragile sheaths and set the crust development back by 25 to 250 years. If the impacts continue, this pothole might dry up completely and blow away, carrying the promise of life with it. Straightening up again, my focus shifted back to the large-pinnacled landscape. Just as in the crust, dusty red sand is at the heart of it all, but the mineral cements of the rocks are much more durable than the cyanobacterial glue. Thousands of humans have walked from cairn to cairn—trusting their boots—with barely a whisper of impact. We joined them again, meandering among spectacular views both big and small.